Browne would probably rather fight Overeem again than this dog. Not a lot of people will know this. 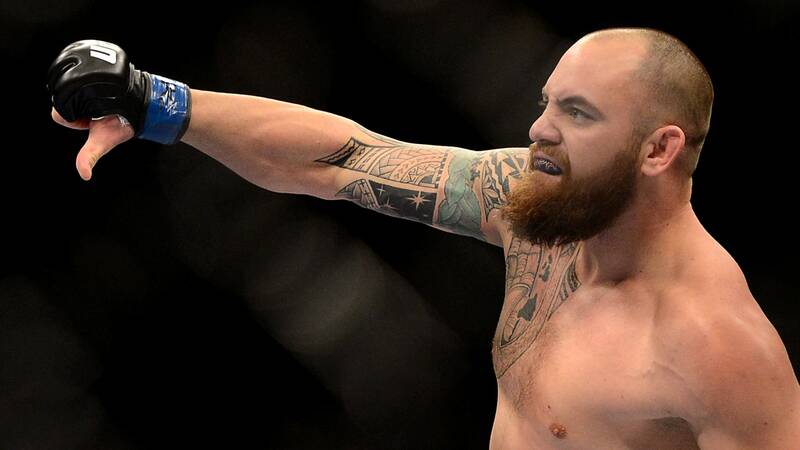 Travis Browne once was beaten up by a dog, 6 inches tall. It raked his nose with its snout. Browne tapped out. 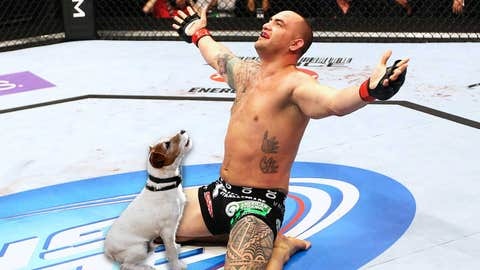 But dog whispering’s loss was MMA’s gain when Travis Browne packed his walking leads, whistles and chains, and left canine training for jiu-jitsu classes. In conversation with the big man not long after he’d dispatched a huge rival in Josh Barnett with those brutal elbows of his, Browne told me of his love for dog training. It seemed a bizarre juxtaposition as we transitioned from cage to "dog rage." He’d been asleep and they handed him over to me kind of like a football. I held him in my hands, and that little dog reached up, clamped on to my nose, pretty much pierced my nose in front of the owners. But it was too good a revelation not to pursue. Thoughts of Werdum, returns against Bigfoot Silva and a possible world title fight with Cain Velasquez faded, paled into insignificance as Browne talked furry mutts. He cajoled, controlled and tamed the mutts who were wrecking homes and the psyches of their "owners." “So I went back to the house about three days later and I picked him up because sometimes I would do a boarding training where I would take the dog for about four weeks. I would retrain the dog and then place it back in the home and then give the owners instructions on what to do. “So, I went back to pick up the dog. He’d been asleep and they handed him over to me kind of like a football. I held him in my hands, and that little dog reached up, clamped on to my nose, pretty much pierced my nose in front of the owners and there I am … my eyes are watering, I have tears coming out of my eyes, blood running out of my nose in front of the owners and they’re like ‘Are you OK?’ and I’m like, ‘Yeah, I’m fine, it’s not a problem.’"
No. Not in reality. There was a happy ending. Over four weeks, the relationship changed. “We were mates, we were buddies, he was the dog I will never forget, he went everywhere with me during those four weeks. He rode in the car so by the end of the four weeks and when I went to drop him off, it was like saying goodbye to a friend. “The Jack Russell is a working dog; people have those dogs out on farms to take care of rodents and critters, and people don’t understand that. We were mates, we were buddies, he was the dog I will never forget, he went everywhere with me during those four weeks. “They take these dogs into the city, to an apartment, and wonder why they tear the apartment up. If you put me in a little space and give me nothing to do, I’m going to go nuts. These little dogs, in sporting terms, are not baseball players, they are more like fighters." And the moral of this story… you can bloody Browne’s nose, tear him up, rip him apart, but he’ll tame you. And after the fight, he’ll be your friend. Or, put another way, big men should fight big men, and let small sleeping dogs lie.